Visiting a public restroom anywhere in the world can be a gamble. Sometimes one is pleasantly surprised: At the Icon Grill in Seattle male patrons are encouraged by a multimedia display featuring scenes of waterfalls, floods and running faucets all set to classical music. I haven’t come across anything similar here in China but I do get a kick every time I visit JUSCO, one of the large department stores in Qingdao. 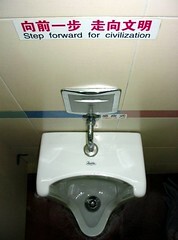 Posted above every urinal is the phrase “Step Forward for Civilization” in both Chinese and English. Apparently the powers that be believe that if we men could just be a little more tidy when taking care of business the world would be a much better place.